(above and left) Two stoneware vases, 6.5", Edinburgh College of Art, 1976. 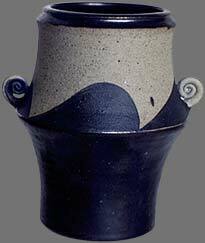 Earthenware floor vase, 18", Halifax, N.S., 1988. 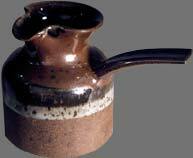 Stoneware liquor decanter and four cups, 9", Foxfire Pottery, Cumberland, Maine, 1975. 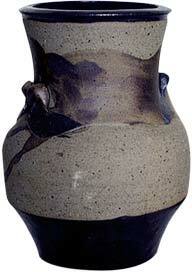 Stoneware creamer, 4", Foxfire Pottery, Cumberland, Maine, 1973.